Sometimes, civilizations vanish without leaving much of a trace. Only vague myths remain about them, such as tales about a land of bountiful art and knowledge which was destroyed by merciless barbarians, tales about a town made out of pure silver constructed in a place never to be found, and tales about arrogant cities sunk beneath the waves. You are the leader of one of these vanished cities. Either due to trickery, ambition or sheer desperation, your capital has been transported into the Sunken Histories, along with a patch of land surrounding it. Setting guideline: looking for renaissance-esque civilizations of strange folks, magitech is allowed, and so does advanced tech in inconvenient whateverpunk form. Your people might be innately magical, or have wings or whatever, but their true strength should come from their technology and culture. [b]Government type[/b]: Who rules the forgotten? [b]Species[/b]: Who dwells in these lands? [b]Description[/b]: What makes your realm unique? [b]Leader name[/b]: What is your monicker and rank? [b]Description[/b]: Who are you? Who do you look like? [b]Reason[/b]: You are the reason the city vanished from your world, and ended up here. Was it a bargain? A weapon gone wrong? Or maybe it was a cataclysm and totally not your fault, honest? Will be picking about six players. If you think the information I posted here is incomplete, or vague, please alert me, and I'll expand it as much as I can! 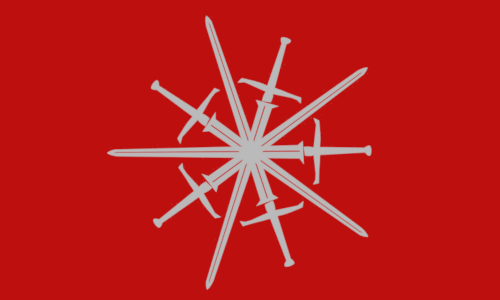 Colour and Symbol: A radial design of five swords in grey on red. Government type: A martial state led by military officers, the Citadel is nevertheless not inherently aggressive, instead focused on jealously protecting their territory. Even if that territory is now great swathes of interdimensional swampland. Species: Doraxians, grey-carapaced insect-like humanoids with spindly limbs, large compound eyes, feathery antennae and a love for order, fruit preserves and percussion instruments. Description: The Crimson Citadel is built around a large, red-brick circular fortress city, the titular crimson citadel. This city, and the other fortresses under its control, were previously on the frontier of the great Doraxian empire, protecting it from incursions by monstrous demons and other such rabble-rousers. The safeguarded the border with their heavily armoured infantry and expert crossbowmen, drawn from the population of the city and from recruits sent from the rest of the empire. But when they broke their oaths and invaded the empire to depose its rightful king, the magnitude of this treachery opened the ground beneath them and swallowed them whole, leaving a great chasm along the border to protect the empire instead. Thus rebuked by the gods themselves, the top brass of the Citadel still feel guilt and shame about this betrayal. They are trying to atone so they might be allowed to leave this hellish dimension, which they believe to be divine punishment. Description: A tall Doraxian rarely seen outside of full uniform, which looks like someone took a world war 1 officer's uniform and dyed it red. He wears dozens of medals when in full dress and always wears a peaked officers cap, also red, which his antennae poke through. His carapace is grey, and his dark compound eyes have a slightly blue-green tint. Reason: Osthix got greedy and ambitious, and thought he could use the vast military power of the Crimson Citadel to conquer the Doraxian empire and declare himself Emperor. The gods, or perhaps some other interdimensional entity, did not look kindly on this oathbreaking and treason, and cast him and the entire Crimson Citadel into this abyssal dimension in response. Government type: A noble oligarchy led by an elected Prince. Sometimes the nobles elect more than one prince to lead them, in which case they share power. Species: Ardes - Tall and spindly humanoids with bird-like legs and feathered crests on their heads instead of hair. Rarely some are born with beaks, and this seems to be becoming more common. And then, the swamps of the Sunken Histories. Species: Matches live in the realm of Matchbox. Typically a match refers to oneself as a Matchbox. Matches are technological beings that are lizardine in shape and are about the length of a pencil. Matches are produced in batches of 6 from a Matchbox-α. The make of a batch of matches is dependent on the material that was fed into the Matchbox-α. They can be metallic, organic, or biologic. Description: Matchbox is built on the remains of a precursor city. The first Matchbox-α went online shortly after the precursor civilization had fallen. That Matchbox-α is designated as Matchbox-Prime, and was the womb of matches for hundreds of generations. Nobody is certain on how or why the precursors died. There are no traces of precursors other than their structures and technology in the city; no precursor body were ever recovered. The most accepted theory is that heat suddenly spiked and caused many oxygen producing organisms to die. Some accidents that was likely triggered by a volcanic eruption caused the oxygen levels in the atmosphere to drop to critical levels. The atmosphere was no longer able to support large aerobic organisms and they subsequently died off, including the precursors. Some don't believe this theory, and say that precursors are still alive and out there hiding in oxygen rich vaults. Description: Matchbox-R17-3 is a metallic match with a yellow plastic skin and orange eyes. Marc is a believer of the Precursor Survival theory. They are aloof and a bit of a fanatic. Reason: Matchbox-R17-3 led a team of explorers in an old nuclear facility by a nearby dammed lake. The previous exploration team had discovered and reported not only interesting precursor technology but also materials that emitted exotic "light". The exotic light was observed to have an adverse to biologic matches and so they were barred from joining any expeditions to the facility, but unfortunately, a batch A17 had joined the expedition and exploded in the middle of the expedition; A17s were unfortunately partly made of explosives. The explosion damaged a number of technology, and caused contaminated water to leak out to the lake. The explosion also accidentally caused a machine underneath the facility to activate. It was a machine so complex that it was more alien than it was a precursor machine. It thrummed with power and soon that power was released in an expanding brilliant sphere that annihilated and consumed all of the city. Colour and Symbol: A blue flower with D5 symmetry. Species: Sentient robots (synthetics) and cat people (felics). Description: This society exists as a city inside a world overgrown by nature, with the rest of society having vanished into Abrasia after a distant apocalyptic past. Their technology is powered by synchronicity, relationships which can't causally be explained by physics, but are meaningful and connected nonetheless. They can create telepathic machines which communicate with others without causal relation, apart from an address to communicate to. Some theorize this synchronicity is the result of the universe "remembering" things and reading and writing from this memory. Description: A sentient AI built to serve felickind. Despite being a dictator, he is inherently benevolent, as that was how he was coded. Despite being an AI, his sentience led to him gaining a soul, clouding his judgement a bit. His avatar is a cute robotic cat person. 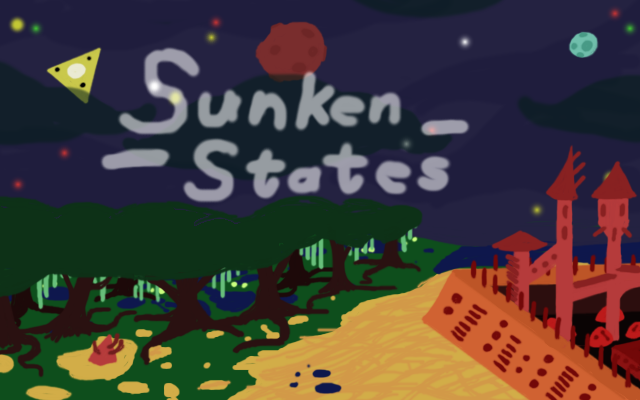 Reason: A mistake was made with a synchronic machine, which led to it connecting to a synchronic machine in the realm of the sunken states, leading to the entire megalopolis to enter. Current time: 04-19-2019, 11:21 AM Powered By MyBB, © 2002-2019 MyBB Group.